Samsung has just announced its first dual SIM phone that features a full QWERTY keyboard. Called Samsung Chat 322, the new handset is a candybar which comes with a dedicated key that “offers convenient access” to any of the two SIM cards the user has installed. The phone also features a trackpad, a rather small landscape display, DUOS UX interface, Facebook and Twitter integration, “push-like email”, Bluetooth, USB 2.0, and a 1.3MP camera. JK Shin, Samsung’s President and Head of Mobile Communications Business, says the combination of dual SIM cards and QWERTY is “groundbreaking” – as if we haven’t seen other phones to have both features before. 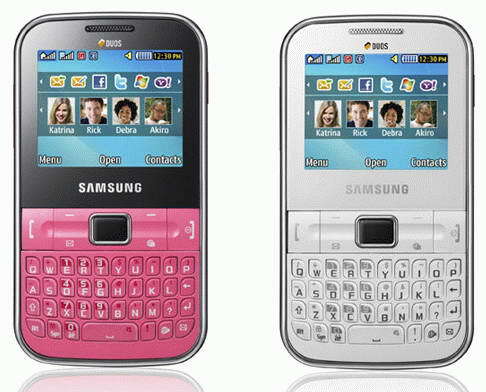 The Samsung Chat 322 will be first available in Russia (starting November), in black, white and pink. After that, it will be launched in the CIS, India, China, Southeast Asia, the Middle East and Africa. The phone’s price has not been announced, but it should be a low one.